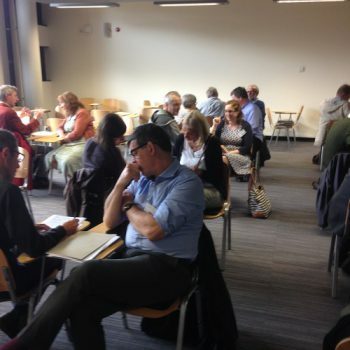 Back in June 2016, the Irish Ramsar Wetlands Committee engaged with wetland scientists, engineers and students attending the Inaugural International Conference on Natural and Constructed Wetlands hosted by National University of Ireland Galway. IRWC wanted to explore the perceptions of the conference delegates with respect to Ramsar and wetland conservation generally. Ramsar to help us establish their knowledge of the convention. Issues relating to wetland conversation. All delegates were invited to participate in a ‘speed-dating’ session for aquatics, where IRWC were able to hone in further on the delegates’ opinions on a variety of wetland management and issues-related topics. This synthesis provides a brief overview of our findings. You can download the full report on this assessment here. A total of 30 delegates completed the questionnaire and 15 teams participated in the ‘speed-dating’ session. Most of the delegates were from Ireland, while the UK, USA, Australia, Belgium, Czech Republic and Poland were also represented. Almost half of the delegates were from academia, while Local Authorities and Environmental Consultants were also well represented. There was a small number volunteers and representatives from NGOs present also. Acknowledging that this of course was an audience highly informed about some aspect of wetland, we expected the results to be somewhat biased, and probably not entirely representative of the wider public. Overall, most of the delegates were aware of the Ramsar Convention and commented, when given the choice, that the intrinsic value of the wetland experience was more important to them than functionality. Favoured wetland species and habitats and words used to describe them by conference delegates are shown in the wordmap to the left. 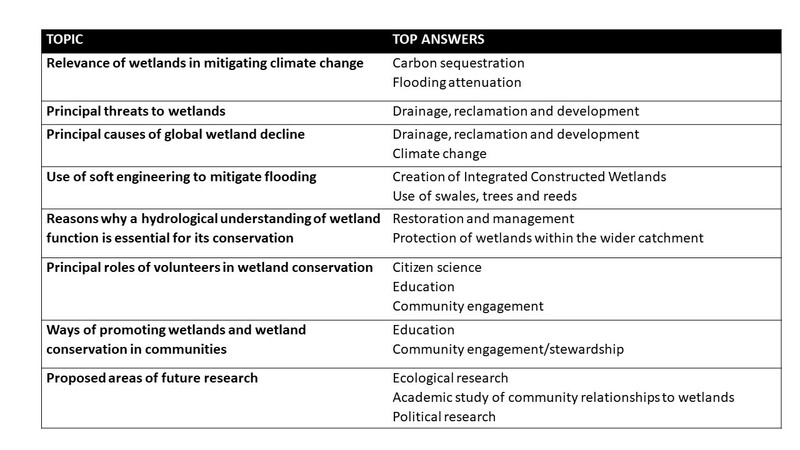 Some of the delegates specific responses on wetland management and issues are presented in the table to the right. Widen the scope of the questionnaire to the wider public to establish basic knowledge of wetlands and how they engage with wetlands. Explore the feasibility of developing a citizen science project that will establish wetland caretaker/ stewardship programmes. Undertake a review of published information on Irish wetlands to identify and understand current pressures and threats, and the knowledge gaps. For further details on the results of this assessment, please download the full report on this assessment here.